Rose knew it was time to start anew. The hurricanes had destroyed her home, and her gardens, and a new opportunity had come. Her husband had been gone the past few years, and she would go to Los Angeles. She had no intentions of finding a new love, but she did look forward to going to the rose garden in Exposition Park. She had heard so many stories as a child of this amazing garden, and how her parents had met there. Rose had no illusions of finding a new love there herself. Instead, she simply enjoyed the time she spent, sitting, and reading a book. Then one day, an artist approaches her and asks to draw her. She doesn't understand why he would choose to draw her portrait when there were lovelier younger ladies around, but he did. It was also obvious that Richard was interested in spending time with her. 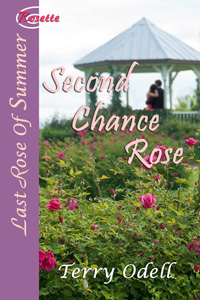 Second Chance Love was a story of a heroine hesitant in how to proceed with the opportunity of a second chance at love. Rose had loved her first husband, and believed that he was her one true love, yet the more time she spent with Richard, Rose realizes that, perhaps, she had been gifted with having a second love. Richard was a touching hero who was an artist, but earned his living as a computer programmer. He was the quintessential geek uncertain in how to court Rose. I adored him.